Each blog in this series will highlight some famous, some infamous, and some lesser known authors throughout history. This week’s focus: German Authors. European history is jam packed with a rich literary history. This is the premise behind our Famous Authors blog mini-series. Each blog in this series will highlight some famous, some infamous, and some lesser known authors throughout history. Previously, we have looked at famous Dutch authors. This week’s focus: Famous German Authors. 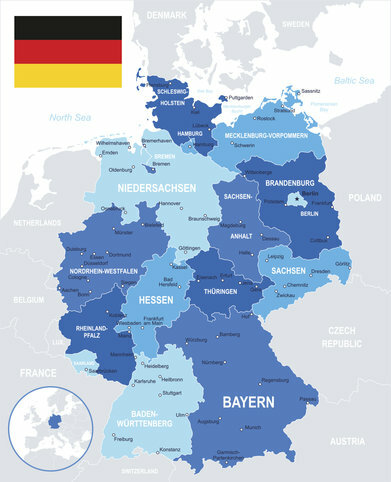 German is the most widely spoken language in Europe. So it shouldn’t come as a surprise that some of the continent’s most acclaimed writers come from Germany. Read AESU’s blog this week to discover some German authors you may not have heard of. Mann is perhaps one of the most celebrated German writers. He is best known for his work as a novelist and social critic. Mann’s novels are full of humor and irony and in 1929 he was awarded the Nobel Prize for Literature. After achieving literary success he became quite vocal in his opposition of fascism and the Nazi Party. He eventually fled Europe and waited out the war in America but that didn’t stop him from being outspoken! Mann continued to record an anti-Nazism radio show and broadcast it into Germany until WWII was over. Johann Wolfgang von Goethe pioneered the ‘coming of age’ stories that became so popular during the last century. His poems, plays and books are still relevant today, more than 200 years after their publication! You should check out his is most famous novel, The Sorrows of Young Werther, if you like reading F. Scott Fitzgerald or J.D. Salinger. Although Kafka was born in the Czech Republic, German was his first language and his most significant works were published in German. His novels had a profound effect not just on German literature but on global literature too. His subject matter was so revolutionary that the term, Kafkaesque, was created. It is used to pay tribute to the eerie, illogical nature of his writing. His best known works are The Metamorphosis and The Trial. Ende is well-known as a children’s author but few know that he was German. His writing style is famous for its ability to make the reader feel involved in the story. He disliked that his books were classified as children’s literature by critics and said that he wrote them for children aged 8 to 80. His best-known work is The Neverending Story, which was turned into a popular movie in the 1984. So dust off that VHS and reacquaint yourself with Atreyu, Falkor the luck dragon, and German author Michael Ende. AESU offers unique, exciting travel programs for college students and young professionals at affordable rates. Each trip is action-packed and informal—designed just for people your own age. We offer several trips to Germany: Euro Focus, Great Escape, and Euro Spree. Want help booking one of your German Excursion? Please contact AESU by calling 800-638-7640 or fill out the contact form found on our website. And don’t forget to check out all of our great Travel Tips, especially the Travel Tips for Europe, before you head overseas. This entry was posted on Thursday, August 27th, 2015	at 5:53 pm	. You can follow any responses to this entry through the RSS 2.0	feed. Both comments and pings are currently closed.